Water covers over two thirds of the earth’s surface, and our bodies are comprised of over fifty percent water in order to function properly. Water is one of the most important resources essential to life. The study of water is so important because all life forms depend on it for survival. The study of water will help us to maintain better quality and adopt successful conservation methods for the future. Studies have shown that climate changes are causing the world’s rivers and other water sources to recede. The study of water may help prevent this incredible loss from occurring. Water quality refers to the balance of the physical, chemical and biological makeup of water. The quality of water is conditional upon the use of the water. Different characteristics are suitable for agriculture but not for drinking water. The contamination of water is an important element that scientists consider when measuring the quality of water. Ensuring good water quality is essential to a healthy life. San Diego Water Quality: A resource for the city of San Diego, California that provides reports on the water quality along with other valuable information on water. US Geological Survey: Useful and informative information about why the study of water quality is so important and what tools are used to measure it. Water Quality Information Center: Information on water quality and agriculture and policies related to water in the US. University of Maine Water Quality: A cooperative extension that uses applied research to improve the water quality production in the area. Drinking Water Quality: Environmental Protection Agency gives information on the quality of drinking water as well as what they do to ensure the public’s protection from toxins in their water. Water Quality: Washington provides a great source of information on how to prevent water contamination and ways to clean up water pollution. NASA Water Quality Experiment: NASA gives great ways that the public can perform experiments to check water quality. Water Health – Information on water sanitation and health from the World Health Organization. Wetlands are areas of soil covered with pools of water that are home to specific plant and animal life and are considered biomes. There are two main types of wetlands and they are coastal wetlands and inland wetlands. Wetlands are commonly found near bodies of water such as oceans and rivers. They are found on every continent except Antarctica. Wetlands provide food, water and other resources essential to human life. They also provide an essential function for the environment by mitigating, which is sinking carbon dioxide as well as adaptation by regulating and storing the water according to the climate. What are Wetlands? : The EPA explains what wetlands are and what their purpose is. Wetlands for Water and Life: A global organization that offers education on wetlands, their purpose and ways that wetlands are threatened. Ramsar Convention on Wetlands: Shows the biodiversity of wetlands and how certain species are dependent upon this biome for survival. National Wetlands Inventory: Tracks the US inventory of wetlands and their health in terms of environment and sustainability. Wetlands Protection Project: A project in Michigan that is dedicated to protecting wetlands in their state. Department of Environmental Conservation: Information about wetlands located in the New York area which includes freshwater and tidal wetlands. Water and Land: A Washington wetlands project that outlines the different types of wetlands that exist and provides valuable resources for education about wetlands. The Aquarena Center: Located on the University of Texas, this wetlands or project is working on restoring the natural wetlands in its area. Water conservation is defined as the effort to reduce the use of water. Conservation is achieved through preservation, recycling, and the implementation of various water saving techniques. There are many benefits of water conservation that include protecting the environment, planning for the future, sustaining energy, and conserving habitats. Water is the most important commodity and without the conservation efforts, water will become increasingly harder to obtain when needed. Natural Resources Conservation Services: An organization that works towards educating the public on conservation efforts. Water Conservation Tips: Great resource for water saving tips for indoor, outdoor, agriculturally and many other water using location. Alliance for Water Efficiency: An advocate of water efficiency that promotes ways to conserve water and use water more efficiently. Water – Use It Wisely: Tips and resources that provide several ways that people can save water and work towards conserving water effectively. Tucson Water Conservation: Tucson city resource guide that gives helpful tips on using water efficiently. San Diego Water Conservation Program: Information on water conservation efforts in the San Diego area with helpful tips and resources available. Miami Dade Water Conservation: Information on the supply of water in this area along with ways that water can be conserved and how this affects the environment. Bureau of Reclamation: The US government’s water conservation efforts and field services program. Watersheds are areas of land where water converges at a single point where it then drains into another body of water such as a lake, estuary, or river. When it rains, water drains through different channels and basins to reach one destination. Watersheds can be all sizes and shapes and can cross state and national boundaries. In the United States alone, there are over 2,000 watersheds. Watersheds help to decrease the occurrence of flooding however, determining the amount of flooding is based on factors such as soil type, land use, topography, and more. Watersheds are essentially the earth’s organic way to drain water. 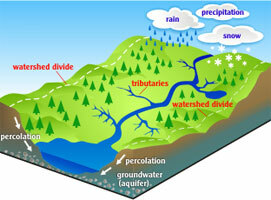 Watershed Definition: A description of what a watershed that offers a visual reference to help explain the resource. Watershed Atlas: A great resource with information on watersheds in different areas and their effect on how water travels. Watershed Characteristics: A breakdown of how watersheds work including the characteristics of watersheds. Coquille Watershed Association: An educational resource that explains the watershed term, characteristics and features of a watershed. Healthy Watersheds: Explains what characteristics are common in a healthy watershed and how this affects the wildlife around the watershed area. Watershed Protection: Watershed protection explains the effects on the environment and quality of water when watersheds are protected. Ohio State Watershed: Valuable educational resource that provides information on the characteristics of watersheds and examples of different types. Streams and Shorelines: Shows how Moxie Creek in Washington is designed and how the life around it remains viable because of the special features of this watershed. Water Resources: A great resource on the different aspect of water and why it is important to stay informed on these aspects. Scientific Facts on Water: Different facts about water that are examined from a scientific standpoint. Worldwide Water Education: A valuable resource that offers detailed education about water from a worldwide perspective. Educating Young People About Water: Educational guides that can help design an education curriculum about water. Water Science for Schools: An educational diagram that is interactive and describes all phases of water from the basic supply of water on Earth to the water cycle. American Water Resources Association: A community of water conservationists that promote improving the quality of water through conservation efforts. California Department of Water Resources: A governmental agency that is dedicated to improve, conserve and sustain water in California. Healthy Water: Center for Disease Control offers information on how to keep water clean and healthy. Aluminum Water Bottles: Learn the truth about aluminum water bottles. Resource Guide to Under Water & Aircraft Archaeology: The goals of this field are varied while some look to understand cultural history and others to study human evolution. Archaeology requires surveyance and then excavation in order to learn about the past.